Summer is a great time for kids to explore the world of STEAM (Science, Technology, Engineering, Art and Math). At SciTech Kids, Central Park and the outdoors become your child’s laboratory. Most mornings are spent outdoors as kids do hands-on science investigations, observations and explorations in our urban ecosystem. Older campers explore STEAM as they canoe, become citizen scientists and fly drones. In the afternoons, campers focus on the weekly theme and explore a range of STEM-based topics such as coding architecture, engineering. Campers also have access to our makerspace and complete projects using recycled materials, electronics, or 3D printers. The best part, campers get to take their projects home. 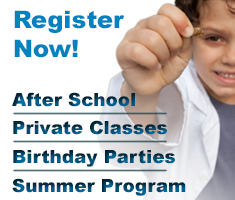 At SciTech Kids Summer Camp, lunch, snack and all scientific supplies are included. Camp meets Monday through Friday at our 2,000 square feet with an outdoor space at 215 East 81st Street. This past year, the program ran from June 12 to August 27 from 9:00 am – 3:00 pm and covers weekly themes and other STEAM-based activities. Our themes range from biology, robotics, video game design, the science of sound and more. Should your child need to remain at SciTech Kids for an extended day, please contact us for more information. build a solar oven in Central Park and use it to make S’mores. build rovers, telescopes, and grow food under similar conditions planned for Mars expedition. Fill a mini pool with oobleck and see how kids can run across it without sinking. become citizen scientists when they collect and send data collected to researchers at Cornell, University, Columbia University and other institutions. become a Maker when they use materials in our makerspace to design toys, robots and gadgets. learn the science behind kick boxing while taking kick boxing lessons at SciTech Kids. build, hack and fly drones at SciTech Kids and a drone facility in Brooklyn. become fashion designers who incorporate electronics into fabrics as they designs costumes, hats, capes and handbags. “go green” and learn how to create an aquarium that recycles wastes and uses it to grow food. take field trips to museums such as the Cooper Hewitt, NY Hall of Science and other educational institutions. become inventors as they conceive and design an invention that can submitted to various contests. 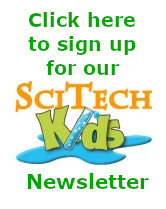 Click here to see what a sample schedule at SciTech Kids Summer Camp would look like. Our staff consists of scientists, engineers, artists, and designers who enjoy sharing their expertise with young minds. Staff members often bring their own projects to camp to show kids real world STEM in action. The/student-teacher ratio is 4:1 for young campers and 6: 1 for older campers. For more details about our Summer Program, call (212) 804-7055.